MySpace for Sharing and Expression, Facebook for Networking? It’s been interesting to watch the foot race between MySpace and Facebook, and even more interesting to watch people’s reactions to the two. Somehow, MySpace got pidgeonholed by the Digerati as a great first try ultimately doomed by the Facebook better mousetrap. These people complain that MySpace is too ugly and unstructured to be useful. He winds up drawing an analogy between MySpace and scrapbooking, which is good, but it isn’t the whole story. A callous interpretation of Andrew’s remarks might even lead one to believe he is recommending that MySpace is groups that are “economically challenged.” The underclass, according to an article Andrew links to. Trailer Trash and Red Necks of the Jeff Foxworthy persuasion if we gone to be more blunt, and believe me, the article Andrew links to gets extremely blunt. I think there is a lot more at work here. 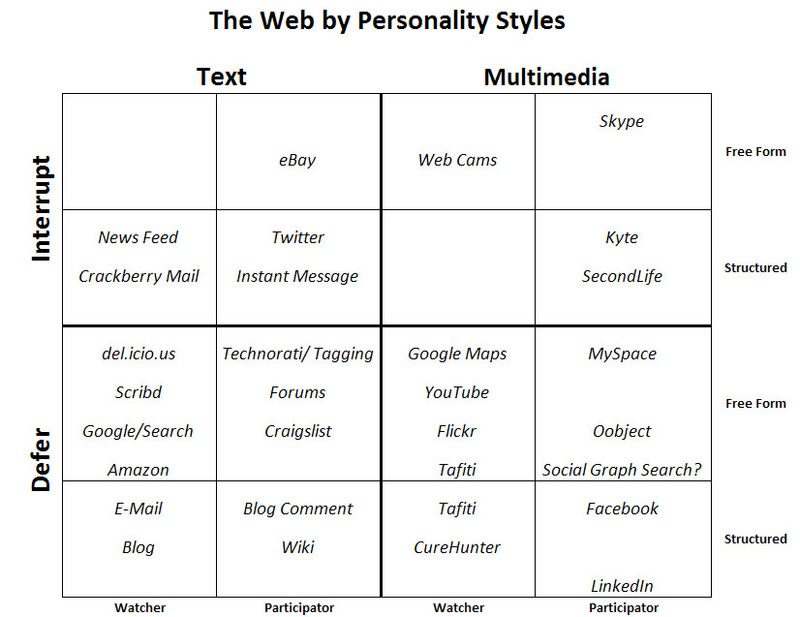 Part of it has to do with what people do on these networks, and part of it has to do with my concept of Web 2.0 Learning Styles. My thesis is that MySpace is about giving the common man a way to express themselves and share that expression. In that sense, Andrew’s scrapbooking is a good analogy. Really, any craft or art form is a good analogy, including blogging, because a big part of it is a desire to express one’s self. Expression is very much an ongoing process. Facebook seems more goal oriented. That goal seems to be networking: How many friends can I notch up? How influential are they? Can I get a hot date (for those who subscribe to the idea that Facebook is largely about college dating). The opportunities for expression on Facebook seem dramatically more limited. Perhaps it’s a natural outgrowth of the goals. If Facebook is all about courtship rituals of one kind or another (yes, business networking is definitely a courtship), then expression can be a dangerous thing. If we express too freely, we may turn off the object of our pursuits. So instead of putting the expression out there as a reflection of our personal taste and talents, which is risky, the expression is channeled into cutesy, low-risk, multiple choice options. “You have 1 gift to give.” My gift today is Thanksgiving leftovers. This allows Facebook users to be cute, coy, or flirtatious, but without putting much of their real persona on the line. Personally, I’d rather meet someone’s fuller expression of themselves before I feel like they are a “friend”. In this case, I show MySpace as a more Free Form and less Structured Facebook. I almost think I should have categorized Facebook over on the Text side of the line, or perhaps defined that dimension as “Simple Media” and “Multi Media”. There is definitely a difference in richness of expression, with Facebook being “Googlier” as Andrew Chen says. Getting back to Andrew’s original remarks, why then does the Valley not like MySpace? Because engineers and business people are often more into structure, participation, and simplicity. It’s the visual thinkers and intuitive crowd that will prefer the MySpace (or similar avenues of expression). faberNovel consulting reaches a very similar conclusion about Facebook and MySpace. On their quadrant, they position MySpace as being about Public Exposition and Fantasized Identity. Facebook is about Real Identity and Qualitative Contacts. I prefer to stick to my view that MySpacers are “expressing themselves” as much as they’re creating “fantasized identities”, but there is truth in both views. This entry was posted on November 29, 2007 at 6:18 pm	and is filed under Marketing, strategy, user interface, Web 2.0. You can follow any responses to this entry through the RSS 2.0 feed. You can leave a response, or trackback from your own site.